The Stratigraphy Commission of the Geological Society of London (GSL) is calling for a drastic and controversial overhaul of the Stratigraphic Guide, the internationally agreed upon standards for the field of stratigraphy. Members of the commission suggest that elements of geochronology and chronostratigraphy be combined to make a new single system, for which they would retain the name chronostratigraphy. 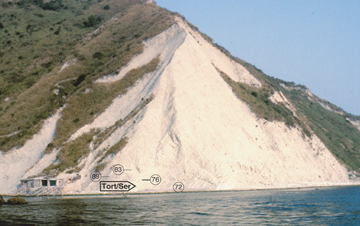 On Monte dei Corvi beach near Ancona, Italy, the golden spike at the base of the Tortonian stage marks the beginning of the Late Miocene 11.2 million years ago. The numbers on the image refer to the various fossil beds. A new paper proposes using golden spikes like this to unify two historically separate geologic time scales. Courtesy of James Ogg. The distinction between the two systems has confused geology students and professionals alike since the first internationally accepted stratigraphic classification was established at the 2nd International Geological Congress in Bologna, Italy, in 1881. There, the Congress created time units and rock units, setting the stage for two separate terminologies. The GSL team, however, argues in the January Geology that, with the ICSs adoption of standardized boundaries, called golden spikes, everything can now be discussed in terms of time. We emphasize here the unwinding of time in geology as one phenomenon, albeit of almost unimaginable duration, the team writes. Golden spikes, or global stratotype sections and points, define a specific stratigraphic boundary and ideally are able to be correlated around the globe through the use of, for example, fossil appearances and disappearances, magnetic reversals and isotope excursions. Because the spikes mark a certain interval of time, they can include both rocks and temporal events, such as volcanic eruptions, meteorite impacts and mass extinctions. Such events, the GSL team says, require a more inclusive method of classification than a system that was originally based on the deposition of sedimentary rocks. The commission proposes taking the hierarchical system from geochronology  epoch, period, era and eon  and combining it with the chronostratigraphic time-rock unit called the stage. This labeling system would eliminate the less-used chronostratigraphic terms of eonothem, erathem, system and series, and reserve the use of the geochronologic word age for general or informal use. Theyre borrowing from both to make one thing, Edwards says. The commission also suggests that subdivisions within periods and epochs should be limited to the terms early and late, to avoid confusion with the terms upper and lower, which, in English, are often used interchangeably. The discussion will continue at the upcoming meeting of the International Subcommission on Stratigraphic Classification in August 2004 in Florence, Italy, where the Geology article is expected to be a hot topic of debate. Readers interested in learning of the history of Cenozoic chonostratigraphic terminology may do so in a substantive discussion of the issues on the occasion of the bicentennial of Sir Charles Lyell's birthday and, in a somewhat more peripheral connection, a paper published in 1999. Berggren, W.A., 1998. "The Cenozoic Era: Lyellian (chrono)stratigraphy and nomenclatorial reform at the millennium," in Blundell, D.J. and Scott, A.C., editors, Lyell: The Past is the Key to the Present, Geological Society Special Publication no. 143:111-132. Aubry, M.-P., Berggren, W.A., Van Couvering, J.A. and Steininger, J.A., 1999. "Problems in chronostratigraphy: stages, series, unit and boundary stratotypes, gobal stratotype section and point and tarnished golden spikes," Earth Science Reviews, 46(nos. 1-4):99-148.